Archaeologists from the University of Leicester who are leading the search for the lost grave of King Richard III announced today that they have made a new advance in their quest. They have uncovered evidence of the lost garden of Robert Herrick – where, historically, it is recorded there was a memorial to Richard III. Now the 'time tomb team' as they have become to be known has discovered paving stones which they believe belong to the garden. The University of Leicester is leading the archaeological search for the burial place of King Richard III with Leicester City Council, in association with the Richard III Society. In 1485 King Richard III was defeated at the battle of Bosworth. His body, stripped and despoiled, was brought to Leicester where he was buried in the church of the Franciscan Friary, known as the Grey Friars. Over time the exact whereabouts of the Grey Friars became lost. The project which began two weeks ago has involved digging of two trenches at a council park- and this week a third trench was excavated. Earlier this week, the archaeologists confirmed they had found the church of the Grey Friars and now they have found the garden outside the church. Philippa Langley, of the Richard III Society, said: "This is an astonishing discovery and a huge step forward in the search for King Richard's grave. Herrick is incredibly important in the story of Richard's grave, and in potentially helping us get that little bit closer to locating it." In the early 1600s, Alderman Robert Herrick, a mayor of Leicester, bought the land of the Grey Friars and built a large mansion house with a garden on the site. In 1612, Christopher Wren, father of the famous architect, was visiting Herrick and recorded seeing a handsome three foot stone pillar in Herrick's garden. Inscribed on the pillar was: 'Here lies the body of Richard III sometime King of England'. This is the last known record of the site of King Richard's grave. Richard is historically recorded as being buried in the choir of the Church of Grey Friars. Thereafter, in 1711, Herrick's descendants sold the mansion house and garden. After passing through various owners the mansion house was eventually pulled down sometime in the 1870s and the municipal buildings were built. However, Herrick's garden seems to have remained a garden, or wasteland, up until the 1930s - 40s when it was tarmacked over to become a car park. Mrs Langley added: "The discovery of Herrick's garden is a major step forward and I'm incredibly excited. In locating what looks like one of the garden's pathways and, potentially, its central area which could have once held the three foot stone pillar marking the location of King Richard's grave, we could be that bit closer to finding the resting place of Britain's last warrior king." 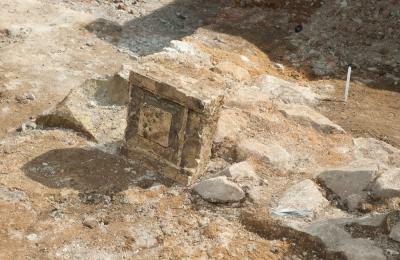 Mr Buckley, Co-Director of University of Leicester Archaeological Services, said the area of paving was found at its southern end, composed of re-used medieval tiles laid in a haphazard pattern. "The tiles were also extremely worn and of many different sizes. Although the date at which the paving was laid has yet to be confirmed, we suspect that it relates to the period of Herrick's mansion. Interestingly, the 18th century map of Leicester shows a formal garden with a series of paths leading to a central point. "The paving we have found may relate to this garden, but it lies outside the church to the south. Inside the church in this third trench, further investigation has revealed some large fragments of window tracery which could well relate to the east window, behind the high altar. If so, this may show that we are in the extreme east end of the building –near the choir where Richard III is said to have been buried. "Having overcome the major hurdle of finding the church, I am now confident that we are within touching distance of finding the choir – a real turning point in the project and a stage which, at the outset, I never really thought we might reach." The dig is being filmed by Darlow Smithson Productions for a forthcoming Channel 4 documentary to be aired later this year.